Twins share lots of things when growing up, but conjoined twins have to share even more. 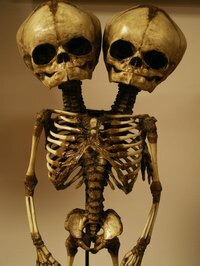 Conjoined twins’ skin and internal organs are fused together and sometimes they share limbs, causing them to only have two arms or legs amongst the two of them. People in conjoined twin costumes are often seen trick-or-treating or at costume parties – two people usually share one large shirt. Try a different spin on your conjoined twin costume, one where you don’t have to share your space with anyone else. Mobility will be much easier and people will have a fun time trying to figure out which limbs are yours. Unbutton one of the shirts and lay it on your work surface. Take a yardstick and lay it on the inside of the shirt at the center of the collar. Draw a line down the back of the shirt with an air-soluble marker. Repeat for the second shirt. Cut both of the shirts in half by following the line. Pin the right sides together of the left side of one shirt and the right side of the other. Stitch the shirts together using a straight stitch and a 1/4-inch seam allowance. Set a pair of the pants flat on the work surface. These will be the pair that you will wear. Place the yardstick on the center of the right leg. Mark a line up the entire length of the pants. Cut along the line. Half of the right leg will be gone. Repeat for the left side of the other pants. Turn both pairs of pants inside out. Pin the pieces right sides together. You will be matching up the pieces to create a leg from the two halves. Sew together using a straight stitch and a 1/4-inch seam allowance. Flip right side out when you are done. You should have two pairs of paints joined together. They will only have three legs – one of each solid color and one that is half of each color. Staple the cuff of the leg that will be empty onto the top of a tennis shoe. Stuff the leg with fiber fill. Stuff it so it looks realistic – not too stuffed but not too skinny. Hot glue the Styrofoam head into the neck above the right arm. You may want to try the shirt on first and mark for placement next to your head. Let the glue dry. Use the hot glue gun to glue the mask and wig onto the fake head. Put on both long-sleeve T-shirts. Stuff handfuls of the fiber fill in between the two shirts. Place it in your right sleeve and on the right side of your chest. Put on your pants. Use a large belt to help hold up the pants. Stuff fiber fill in the waistband as needed. Slide your feet into the shoes. Put on the button-down shirt. Your arms will go in both sleeves. Position the head so it sits next to yours. Button the buttons up the front of the shirt. Leave it untucked so it covers the waist of your pants. Put on your wig and mask. Purchase your shirts a size larger than you need so you will have extra material when cutting and stuffing. You can use scary or non-scary masks. Make them identical so no one can tell which belongs to the real person.